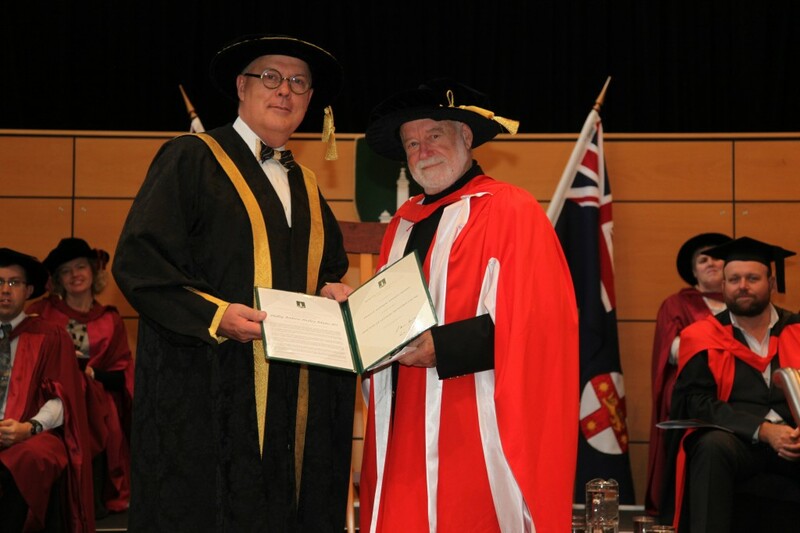 Broadcaster, writer and filmmaker, Phillip Adams AO, today received the award of the degree Doctor of Letters honoris causa from Macquarie University. “This is not my first contact with Macquarie,” said Adams, “as a pride and joy of mine – the Australian Film, Television and Radio School – found its first home on the campus. Adams received the award at a morning graduation ceremony for the Faculty of Business and Economics, where he also presented an occasional address. “Phillip’s master storytelling gives him a unique advantage in capturing the attention of our graduates today, and we are delighted to recognise his contributions to the national conversation,” said Vice-Chancellor, Professor S. Bruce Dowton. Largely self-educated having left school in his mid-teens, he is the author of more than 20 books, and his writing has appeared in many influential publications including The Times and The Financial Times in London, and the New York Times. He previously wrote regular columns for The Age and The Bulletin, and has written a weekly column for The Australian for many years. A successful advertising executive and film producer, his films include The Adventures of Barry McKenzie, The Getting of Wisdom, Don’s Party, Lonely Hearts and We of the Never Never. Adams’ Australia was part of BBC TV’s contribution to Australia’s bicentennial celebrations. Other TV programs include two series of The Big Questions with Professor Paul Davies, and Death and Destiny, filmed in Egypt with Paul Cox. A foundation member of the Australia Council and chairman of the Film, Radio and Television Board, Adams has chaired the Australian Film Institute, the Australian Film Commission, Film Australia, and the National Australia Day Council with the principal task of choosing the Australian of the Year. His many board memberships have included the Festivals of Ideas in Adelaide and Brisbane, the Families in Distress Foundation, the Don Dunstan Foundation, the Museum of Australia, Greenpeace Australia, CARE Australia, the Australian Children’s Television Foundation, Film Victoria and the Anti- Football League. He was co-founder of the Australian Skeptics. As well as two Orders of Australia, he was Australian Humanist of the Year in 1987, Republican of the Year 2005, and received the Longford Award, the film industry’s highest accolade, in 1981. The same year that he was appointed Senior ANZAC Fellow. He was a recipient of the Henry Lawson Arts Award in 1987, and in 1998 the National Trust elected him one of Australia’s 100 Living National Treasures.